Let’s face it — very few law school students have an unlimited budget. If you’re reading this, then you’re in good company. 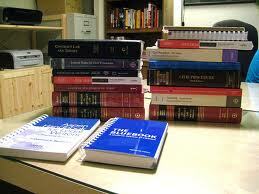 A lot of students find that their law school textbooks are a lot more expensive than their undergrad books ever were. I don’t quite know why this is, but I do know this: you can avoid some of the costs if you’re creative. First and foremost, you can always get them used and save money instead of new. There’s really no reason in the world to get a new textbook, unless you can’t find a used one. Even still, I think I would rather have someone photocopy the pages out of their book for a fee than buy a new textbook. You never get the money back, and if someone steals the book, you’re out another new law book. It’s just better to go used, or not at all. Along with getting used books, you will need to make sure that you are looking for your books as early as possible. The week before class is not a great time of the year to try to get your law books. This is will only upset you in the long run, as you hunt in vain for that final book. Don’t hesitate to email your professors for a list of the books that you will need — that’s what they’re there for. You aren’t going to upset your professor with a question like this. Of course, I could be wrong — but even if you do upset them, that’s a very rare circumstance and that indicates a personal problem. No sane professor is going to be upset if you ask for a list of books they will be using for the semester. Naturally, if you can’t get your hands on the books you should say something, but make sure that you also indicate that you’re seeking out alternative methods of staying in sync with the class. Ordering your books online is a great idea, and it’s one that makes a lot more sense than going into the bookstore. In fact, you never really want to go to the bookstore on campus. The markup is horrendous, and everyone knows it. Going online gives you the opportunity to really comparison shop, which is the name of the game here. There’s nothing wrong with chasing a bargain and shaving off as much money as possible from your purchases. The only time you will need to go to the bookstore is if you have aid from the school paying for your books. In that case, then you really don’t have as many options as someone that has to pay out of pocket for the books. Believe it or not, a lot of my law books were purchased on eBay — they were cheap, and they had the edition that I needed. That’s another good point that you will need to pay attention to — you do not want to end up going with a book that isn’t quite what you’re looking for. I hate to break it to you new law school students, but the editions of the books you buy really do matter. When the teacher tells you a specific page, they really do mean that page. It will definitely show if you don’t have the right edition, so just avoid this problem completely by getting he right edition. Any money you save will only make you more frustrated in the long urn when you can’t keep up in the class. As a side note, your professor will try to be as helpful as possible with you if you’re waiting on your books, but you shouldn’t expect sympathy or pity. The top students in the class will do anything they can to make sure that they have their books, and you should really make sure that you’re doing the same as much as possible. You don’t want to fall behind in law school. In case I didn’t make myself clear, let me repeat that: you don’t want to fall behind in law school! Overall, getting your law books on the cheap really isn’t difficult at all. If you put the tips in this guide to heart, there’s really no limit to what you can accomplish! A lot of students in universities and online school programs find that their law school textbooks are a lot more expensive than their undergrad books ever were.